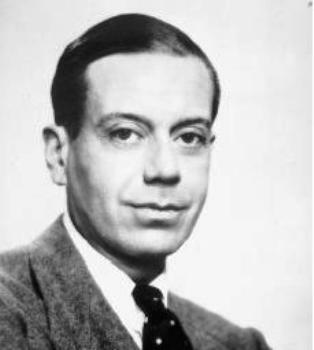 Born to a wealthy Peru, Indiana, family, Cole Porter defied family wishes and took up music as his career. He was classically trained, but became most interested in musical theater and became one of the top Broadway songwriters in the 1920’s and 30’s. “Kiss Me Kate” and “Anything Goes” were among his successes. Individual hit songs includes “Night and Day” and I Get a Kick Out of You.” He composed film scores into the 1950’s. Porter died in California October 15, 1964, and was buried in his native Peru, Indiana.